Timothy graduated from Stony Brook University with his Doctorate of Physical Therapy Degree. Throughout his clinical and professional work, Timothy has gained experience working with a variety of clientele across New York and New England. Beyond traditional physical therapy services, Timothy has provided treatment and assessment for elite athletes consisting of players from major professional sports leagues and Division I-III collegiate athletics. 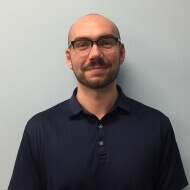 He enjoys working closely with patients to build an individualized plan of care. Timothy utilizes a multi-dimensional treatment approach, consisting largely of manual techniques, therapeutic exercise, and patient education to improve patients’ function, outcome, and quality of life. Outside of the clinic, he enjoys hiking, traveling, and cooking for friends and family.